You may attempt to throw a fully resistant partner with full force and speed all the way into the mat, BUT you must help him to fall properly. Of course, most of our practice is much less than full force, speed, and resistance, but you still must help to insure the safety of your partner. 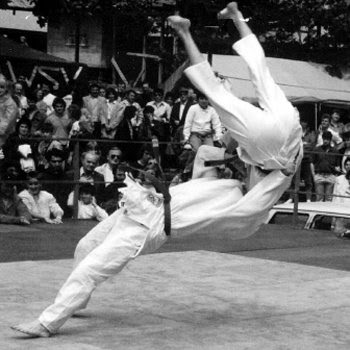 An interesting instance of the Gentleman’s rule in judo is this… Often it is safer to throw your opponent with full force and speed directly onto his back. Otherwise, if you give some people some slack, either in the form of reduced force or speed, they will attempt to turn out of the technique and end up injuring you or themselves (give a guy an inch and he takes a mile). So, a lot of times, you’re actually doing the guy a favor by blasting him. On the other hand, there’s not much faster way to get thrown out of my class for being an a-hole than blasting your practice partners into the mat every single time you touch them. If you know it is kata (form) or nagekomi (throwing repetitions) or randori (sparring) instead of shiai (lit. death match), and you know that your partner will take a fall, then you can modulate your force and speed. But you still have to help him fall correctly. This is sort of a trust but verify ideal. Trust that you're practicing with a partner rather than an opponent, but verify that proposition by throwing him hard, fast, and correctly every time. We have some guys that will slam you on your head the first chance they get. I'm extremely careful when doing randori with them. One of those guys dislocated another BB's knee the other day. The "gentleman's rule" is universally valid unfortunately.